Samsung recently announced the official launch date for its Galaxy S10 smartphones, and we can’t be more excited about that. With this launch, Samsung would complete 10 years for its Galaxy S series. The galaxy s series phones launched in the first 5 years were definitely good, but none of them were the game changers. And then in 2016, Samsung bought forward the Galaxy S6 smartphones. The Galaxy S6 smartphones came with two revolutionary changes: wireless charging and Curved edges display. Then in later years, they bought Always on display in S7, Infinity display and iris scanner in S8, and Dual cameras in galaxy S9+. And, watching all of this has been really exciting. With the S10 range, that’s launching on Feb 20th 2019, Samsung promises to deliver few of the most revolutionary upgrades to its smartphones. Let’s have a look at few of them. Ok, we know that there are several phones in the market that have already bought forward the under display fingerprint technology, but Galaxy S10 would be the first one from Samsung to have it. Samsung introduced the fingerprint scanner for the first time in Galaxy S5. The fingerprint scanner then was mounted on the front home button. Then with the launch of the Galaxy S8 range, Samsung moved the scanner to the back. And now, it’s going to under the display. Notch display was first seen on iPhone X and since then it became a trend. With time, the notch in itself revolutionized. Now we have a normal notch display, v notch display, and teardrop notch display. And now, Samsung is all set to come up with a new type of display i.e. said to be punch hole display. In all the 3 variants of Galaxy S10, you will get to see a hole, which is actually a camera placement, at the right top corner of the display. In the case of S10+, the hole gets bigger since the phone come with two front-facing cameras. With Galaxy S9+, Samsung introduced dual rear cameras that were really great. Now with S10, you need to get ready for those triple cameras. Two of the 3 cameras would be 12mp cameras, while there is no news about the 3rd one yet. Remember, the combination of the triple camera is only available on galaxy S10 and S10+. S10e/lite would still feature dual real cameras. If we believe in the rumours, Samsung has done has done a great job on the S10 range in terms of RAM and storage. S10e would come in a single variant of 6GB ram and 128GB storage, while the S10 would come in an additional variant of 8GB RAM and 512GB storage. But the real surprise comes with galaxy S10+. The Galaxy S10+ would have multiple variants with up to a maximum RAM of 12GB and maximum storage of 1TB. We would not say that we are surprised by the 12GB RAM, but 1TB of storage on a mobile phone is surely very surprising. 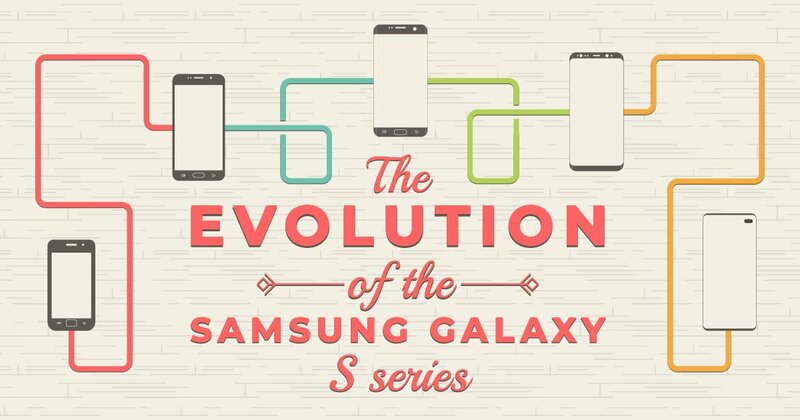 If you are further interested in having a look at how the Galaxy S Series evolved in the past decade, then this infographic from Gadgetsdeck.com would be quite helpful to you.